Fit Fluential Mom: Tri Tip Dinner! So, last week I had NO idea what I was going to make for dinner and while at Trader Joe's, I picked up a seasoned tri tip. I've never made tri tip in the oven, I prefer it on the barbecue, but I figured why not give it a try! 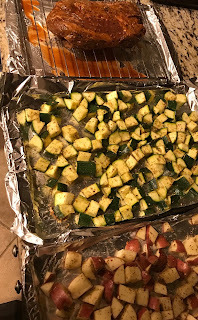 I picked up some potatoes and zucchini squash to make with it and went home to make dinner! Within 45 minutes, we were eating and it was SOOO good and SOOO easy! So here ya go! Enjoy and hope you give it a shot! 2. Place the tri tip on top of a rack and then on top of a cookie sheet. Place it in the oven. 3. While the tri tip is cooking, cut the potatoes. I cut them in cubes. 4. Toss them in a little olive oil and season them with basil, rosemary and I also used Costco no salt seasoning. 5. Do the same with the zucchini. Cut it up in cubes, toss them in a little olive oil and season with basil, rosemary and no salt seasoning of your choice. 6. Place on a cookie sheet (use non stick spray) and bake until the trip tip is done. About 30 minutes. 7. That's it :) When the tri tip is to your liking (I like it medium rare), take it out, slice it up and ENJOY!